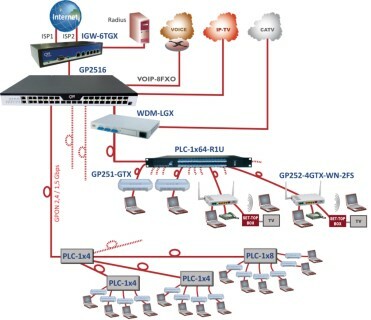 GP2500 is provided with either 8 or 16 SFP slots for GPON optical modules. Each interface can connect to 128 ONT terminal equipment with 2.5 and 1.25 Gbps (Down / Up) Ethernet bandwidth. GP2500 has 8 Ethernet up-link ports, 4x RJ45 and SFP Gigabit combo ports and 4x SFP+ 10 Gigabit Ethernet ports for best connectivity flexibility but also guaranteed bandwidth and SLA performance that telecom service providers expect. GP2500 embeds all required hardware capacity and software protocols to ensure strict SLA to customers (Service Level Agreement). GP2500 relies on a high performance switching architecture with 205 Gbps backplane capacity that supports Layer 3 routing services. GP2500 is a stand-alone GPON OLT with plug-an-play operation and easy web interface management. Service providers can manage large access networks from a NMS software and secured Snmp v3 protocols. GP2500 has two redundant AC and/or DC power supplies for 99.999% system availability. CXR GP2500 is highly appreciated by telecom service providers for its high level of integration to deliver 16x GPON interfaces in a compact 19''/1U chassis with two redundant power supplies. GP2500 is also a perfect stand-alone solution for smaller requirements thanks to its plug-and-play operation and very easy management from a user-friendly web interface. CXR GP250 ONT's are offered with a broad choice of communication interfaces such as Gigabit Ethernet ports, Wi-Gi, Voice over IP (VoIP) and video (CATV). Their connection to GP2500 OLT is totally plug-an-play.